Whether mild to moderate and moderate aortic regurgitation should be corrected surgically during other cardiovascular surgeries remains controversial. We evaluated the effectiveness of external suture annuloplasty in such cases. 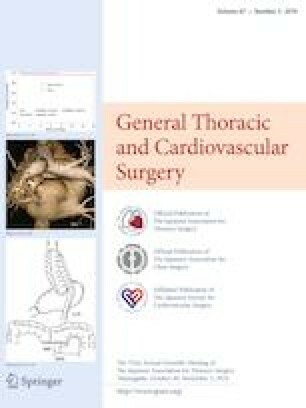 Among 95 patients undergoing aortic valve repair between December 2013 and March 2018, five patients with mild to moderate and moderate aortic regurgitation due to aortic annulus dilatation (type Ic lesion) underwent surgery for mitral regurgitation and/or thoracic aortic aneurysm. Aortic valves were repaired with external suture annuloplasty alone with a mean Hegar dilator size of 20.4 ± 0.8 (20.0–22.0) mm at the same time and were followed up echocardiographically. There were no cases of mortality or major morbidity. Intraoperative direct measurement revealed ventriculoaortic junction size of 25.0 ± 0.8 (24.0–27.0) mm. The average cardiopulmonary bypass time and aortic cross-clamping time were 139 ± 46 (76–205) min and 105 ± 38 (58–172) min, respectively. Postoperative transthoracic echocardiogram during hospitalization showed trivial aortic regurgitation in all cases, with average ventriculoaortic junction size, aortic valve area, and peak and mean transvalvular gradient of 19.1 ± 0.7 (18.0–20.3) mm, 2.24 ± 0.48 (1.60–3.00) cm2, 6.4 ± 1.9 (4.0–9.2) mmHg, and 3.5 ± 1.1 (2.1–5.2) mmHg, respectively. Ventriculoaortic junction size was significantly decreased (P < 0.05). There have been no changes in ventriculoaortic junction size (P = 0.32) or other echocardiographic findings for 24 ± 6 (17–36) months after surgery. Although concomitant with other cardiac surgeries, mild to moderate and moderate aortic regurgitation could be repaired without clinically relevant additional surgical duration. External suture annuloplasty is a useful, safe, and secure treatment choice for type Ic lesion-induced aortic regurgitation.